Lattes-Montpellier were without Alicia Poto and Iva Perovanovic for the Coupe de France final because their contracts had come to an end on 30 April. However this did not stop them from picking up the Joë Jaunay trophy. Gaëlle Skrela and Ines Ajanovic (MVP) led the way with 13 points each. Sandra Dijon-Gérardin and Fatimatou Sacko also finished in double digits with 12 points each. After two final victories with Bourges Basket, Ana Lelas made it three wins in a row with Montpellier beating USO Mondeville (63-54). For Mondeville Lenae Williams finished with a game high 19 points and Valeria Berezhynska added 10 points. Look back on how Lattes Montpellier and USO Mondeville reaching the final. Both teams struggled to find their mark during the first four minutes. Despite a lot of missed shots and turnovers the teams were equally matched (6-6). K. B. Sharp hit the first shot from the land of many and Mondeville started to move away. Once again the energy off the bench helped Mondeville open up a slight lead (11-7) with Touty Gandega sparking her team-mates into action. The battle in the paint between the big players from both sides picked up with players getting blocked left right and center. Montpellier made up their deficit and ended the first quarter on level terms (13-13) thanks to their captain Gaëlle Skrela. Both teams were rather hesitant at the start of the second quarter with good defense and terrible shooting. As a result the game remained tied (17-17) with 13 minutes played. When Lenae Williams hit a delightful trey she kick started a 13-2 run for Mondeville (30-19). Valéry Demory (left), the coach from Montpellier, called a time-out with two minutes to play before the break. Whatever he said had an effect as Montpellier went on the charge with Fatimatou Sacko and Skrela leading the way to reduce the deficit to 4 points at the break (29-33). The third quarter was a scrappy affair. Montpellier managed to neutralise Sharp and Williams before drawing level with back to back scores from Ines Ajanovic (37-37) at the 24-minute mark. Ajanovic was to split a pair for Montpellier for her side to go briefly in front. Then an Esther Niamke-Moisan trey put Mondeville back in front. Yet both sides had problems hitting free throws and went into the final quarter all square (43-43). It appeared as if there was a force field round the Mondeville basket as they continued to miss the unmissable inside the paint. With five minutes left to play the teams were still level (47-47). Sacko broke the deadlock with a trey which was quickly followed by 2 points by Sandra Dijon-Gérardin. Montpellier were on their way as they did not allow their opponents a chance to regain the lead again. Mondeville went scoreless during the last two minutes while sending Montpellier to the free-throw line. Cyreille Hugues who is leaving Montpellier her season ended herewith on a happy note. She came on for the last 23 seconds and with her only shot of the game she scored for Montpellier to win (54-63). 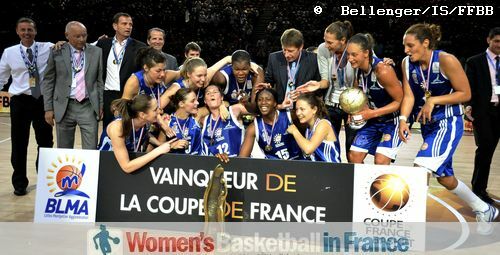 This is the first time in the history of the basketball Coupe de France that Montpellier have won this trophy.